Tectonic Pate » It’s… it’s… No, I give up. It’s… it’s… No, I give up. I get sent a lot of press releases in the course of a working day. Sometimes it can literally be hundreds. It’s my fault for not hunkering down and sticking to one subject matter to write about. I get everything from update reports on hospitals in Libya to… well… this. It’s… one of the few things to have actually made me stop during a busy day and pay more than a cursory bit of attention to an email that should have been filtered through to my PR bin (for searching through at a later date if I’m really, really short of a story). 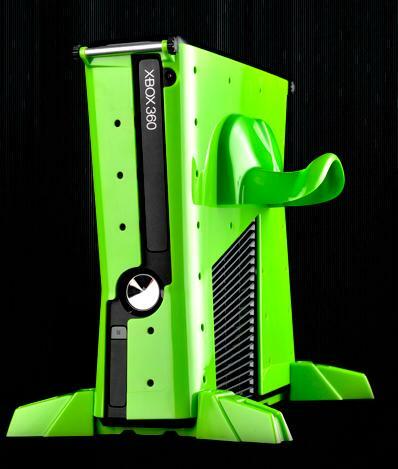 Apparently, it’s a cover for an Xbox 360 that “is a brand built from the ground up to provide everything the avid gamer needs to get the most out of their console”. Look, it’s colourful and it’s got hooks you can hang gamepads on. It’s what every living room needs, right? It’s almost the perfect press release: Pointless product, eye stopping picture, no direct link for more information, sent to a list bought in from somewhere else without actually bothering to check and see if I write about Xboxes. Which, apart from in very specific circumstances, I don’t. The reply-to address is simply ‘PR’ too, so I have no idea who it’s from.